Shopping for Rocky Action Figures? Get your retro fix with this fantastic retro action figure version of Rocky in his grey sweatsuit! This poseable 8-inch action figure is dressed in tailored fabric clothing similar to the retro toy lines that helped define the licensed action figure market in the 1970s. Rocky is based on his iconic run through the streets of Philadelphia. 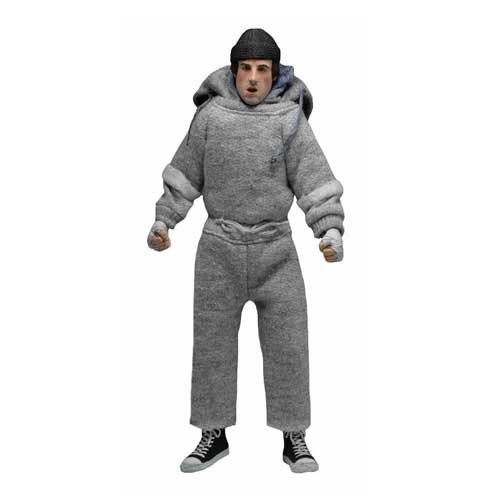 He comes complete with layered sweatsuit with hood, sculpted hands and feet, and a photo-realistic portrait. Blister card packaging with removable protective clamshell. Ages 14 and up.